These shoes are easy to slip on, and keep your feet dry. A little over a year ago, I decided to check out GardenShoesOnline.com, because they had helped to sponsor the Chicago Spring Fling, a garden blogger meet-up. Their website was a bit different back then, but I noticed in the fine print that this company was located about twenty-five minutes away. Even better, they had a blogger for their business, and I figured, if the company was near me, it was likely that their garden blogger was also near me. A local garden blogger. Yippee! That’s how I got to meet Teresa of Gardening with Soule, first via email, and eventually face-to-face. During one of our times together, she asked if I had ever tried a pair of Muck Boots Daily Garden Shoes. I told her I have really wide feet and I need to have orthotics in my shoes because of high arches. She thought they would still work for me, and the next time we met she brought me a pair to try. At first, they were a bit snug, but not uncomfortably so. I discovered I could remove the insole that came with them and put in my custom orthotic. After a few weeks, they really loosened up and I found I could put in my orthotic and then put the cushiony insole that came with the garden shoes on top of that, and they were quite comfortable. At the time, I didn’t realize GardenShoesOnline will let you exchange your footwear for a different size and pay the shipping for the return and the new pair. If I’d known that, I would have tried some garden shoes a lot sooner! My favorite time to wear them is early mornings in spring and summer when the dew is heavy on the ground. I can’t tell you how many times I have soaked my feet, even in supposedly waterproof shoes, just by walking around my garden taking a look at what’s blooming. They are great for any time you need to step outside in a hurry. Ask my daughter Cadie: she slips into them when she needs to harvest herbs, feed bread crusts to the chickens, or snap a picture of a bird at the feeder. Eventually I figured out that Green Cure, which I had used on my peonies, and GardenShoesOnline have the same parent company: GEARCOR.com. Thanks to Teresa, I am going to be visiting the new Gearcor facility this Friday, along with a few other local bloggers. I’m looking forward to learning more about this local business, seeing the wide variety of products they offer and meeting Teresa’s fellow employees. Because of my happy experience with Green Cure and the Muck Boots Daily Garden Shoes, I signed up for Gearcor’s affiliate program, which means if you go to their site from one of my links and buy something, I get a modest commission. Thank you to all who have already done so! In Europe they don’t have these problems (at least they didn’t when I lived there 15 years ago) I’m so happy to find a place that has wide shoes. I wear a 5 EEE. I used to buy boys shoes but even those are now to narrow. When will US manufactures realize that they are destroying their companies by having items made in CHINA??? I’m differently checking these shoes out. I’ll post back to let everyone know how they performed. I’m a disabled veteran on a fixed income so every penny is needed. 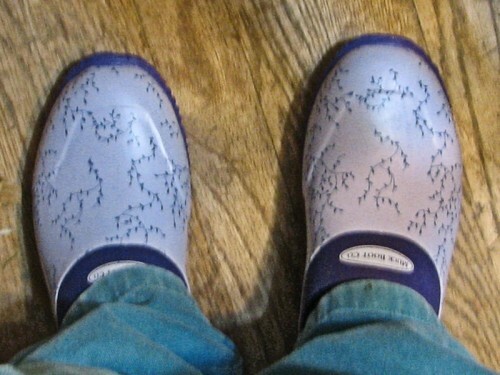 I purchased (invested) in two pairs of Muck-shoes… Men’s sizes 10 and 11. My purpose for their use was for mowing the lawn and tending to the flowers. After a short time… They stretched out at least 1 full-size. As a result, my foot would slip out of the shoe and cause my ankle to turn on wet-grass and slight inclines. I have been in contact with the Muck folks… The first few responses blamed me for ordering the incorrect sizes. I explained they fit just fine when first purchased… In fact my big-toes were pinched. The final offer was for me to send them back “at my cost” for the evaluation of manufacture defects. Given their lack of willingness to correct the problem after the first few attempts… I wasn’t falling for it! Since I am the size 11… I down-sized to 10. Okay fit. BUT… Now the tread on the heels is wearing. I never knew grass would be so destructive! I’ve been looking for a new pair of garden shoes, my old sneakers are getting pretty uncomfortable (and they’re not waterproof). I’ll have to check them out. I love my daily garden shoes. If your shoe size is a half size, there can be a problem with slipping since they only come in whole sizes. Usually, if you have an extra pair of insoles in them, it takes care of that. I’m on about my sixth pair of muck shoes (they get WORN). The only negatives are that they don’t have much traction on slippery or muddy slopes, so I’ve ended up on my rear end more than a few times; also the rubber in the soles is pretty soft, and I’ve had some close calls stepping on locust thorns, almost driving a thorn into my foot. However they now make them with a thick, cleated sole, so I have a pair of those for more treacherous conditions. Hey, Don! Long time no see! Locust thorns are wicked; I’ve ruined wheelbarrow tires on them. Do they stay on? I hate wet feet, but some of the garden shoes I have are more like clogs and they slip off when I’m going up or down our hill — then I have really wet feet! So, I’ve usually used old tennis shoes, but they have the leak problem. Enjoy the factory tour! Mary, I never wore them going up our hill, because that leads to the woods, and I always put on hiking boots for that. Since I started wearing my orthotics in them, they do sometimes slip up and down on my heel, but of course I don’t have as much depth in them because I am using the orthotics. I love these shoes! I got a free pair at Spring Fling, but I had already had an old pair that I had worn so much, they wore out (I had them for a long time). They are the best garden shoes for spring & fall.